Contrary to Prime Minister Netanyahu’s refusal – 84% of the public wants to anchor the principle of equality into a Constitutional Law. Also: parties that herald giving the Declaration of Independence constitutional force would receive additional public support. There is no contradiction between a ‘Jewish State’ and equality. The Coalition misleads the public and prevents constitutional protection for this principle, as well as for religious freedom. Following recent pronouncements by PM Netanyahu and senior ministers and MK in the Government Coalition, stating that the principle of civil equality is safeguarded in Israel and therefore needs not be included in the Nation-State Law or other Basic Law. Hiddush – For Religious Freedom and Equality surveyed the views of the adult Jewish Israeli population. The public, as opposed to the Government, supports amending the law and granting constitutional protection to the principles of equality and religious freedom promised in Israel’s Declaration of Independence. 84% responded in the affirmative to the question: “The Declaration of Independence promises that in the Jewish State ‘full social and political equality, regardless of religion, race, or gender’ as well as ‘freedom of religion and conscience’ will be ensured. 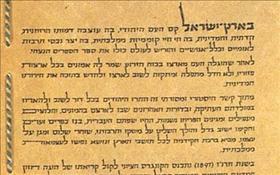 Do you support or oppose the explicit anchoring of these principles in Israeli law and their receiving constitutional protection in a Basic Law?” Among the 84% are majority of the Zionist Orthodox and traditional Jewish Israelis, as well as the majority of those who voted for the non-Haredi Coalition parties. Moreover, following the heightened public and political discourse regarding the question of whether the principles of the Declaration of Independence should be enshrined in a Basic Law, the survey showed that a party, which would turn this move into a central feature of its election campaign would receive increased support from the public: 36% that this would increase the likelihood that they would vote for such a party, and only 15% responded that it would decreased the likelihood. The position of Netanyahu and his colleagues is hypocritical and illogical – if they genuinely believe that this principle is already protected, why oppose entrenching it explicitly in a Basic Law? Netanyahu and his colleagues are misleading the public, stating that the principle of equality already receives constitutional protection in Israel, including in the ‘Basic Law: Human Dignity and Liberty’. Those who oppose enshrining the principle explicitly in a Basic Law are betraying not only the Declaration of Independence, but also their own voters – the majority of who support the inclusion of the principles of equality and religious freedom in a Basic Law. The only group, the majority of whom oppose it, is the ultra-Orthodox sector, and it is sad to see that once more, the government kowtows to the ultra-Orthodox political parties’ dictates. They opposed including equality when the ‘Basic Law: Human Dignity and Liberty’ was enacted in 1992, and they have maintained their ultimatum ever since. The position of Netanyahu and his colleagues is hypocritical and illogical – if they genuinely believe that this principle is already protected, why oppose entrenching it explicitly in a Basic Law? If they oppose explicitly legislating it constitutionally – undoubtedly, this emerges from their rejection of the principle of equality! The survey was conducted via telephone by the Smith Institute from August 7th – 9th, 2018, among a sample of 500 participants representing the adult Jewish population of Israel. The margin of error is ±4.5%. In response to the question: “The Declaration of Independence promises that in the Jewish State ‘full social and political equality, regardless of religion, race, or gender’ as well as ‘freedom of religion and conscience’ will be ensured. 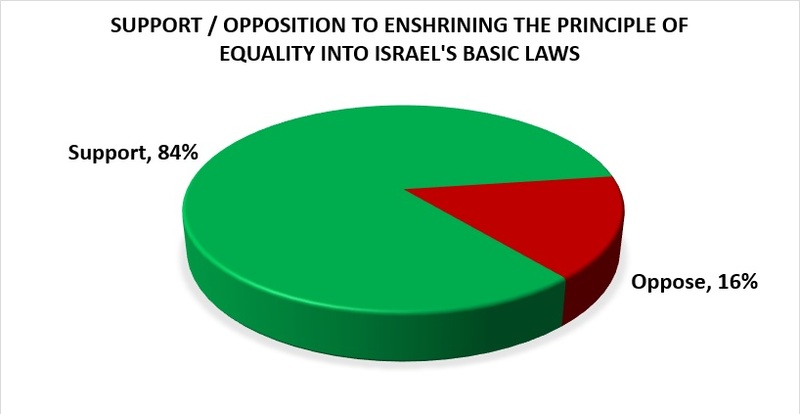 Do you support or oppose the explicit anchoring of these principles in Israeli law and their receiving constitutional protection in a Basic Law?” 84% responded in the affirmative (43% very much support this, and 41% support, 8% oppose, and 8% strongly oppose). This is among the 90% of respondents who expressed an opinion. Analyzing the support data based on the respondents’ self-identified levels of religiosity, it clearly emerges that support is very high not only among the secular, but also among Zionist Orthodox (71%) and traditional Jewish Israelis. (Traditional – close to religion: 84%, Traditional – not so religious: 87%, and Secular: 93%). 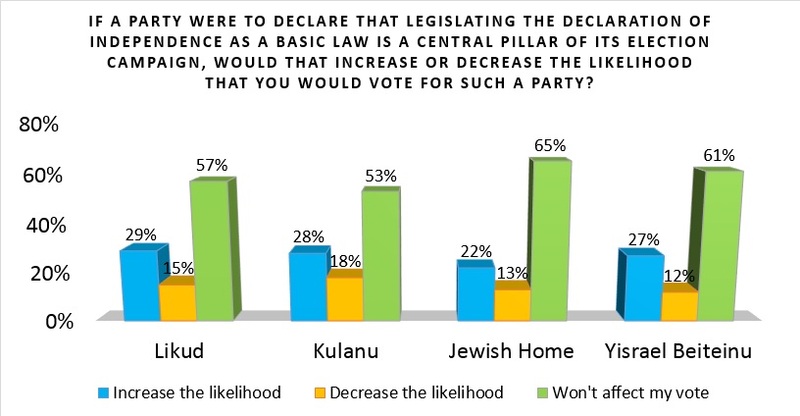 Significant support was measured even in the ultra-Orthodox sector (41%). There is little variation in support based on level of education: 87% of high school graduates, 80% of those with a post-high school education, 84% of those with higher education expressed their support. 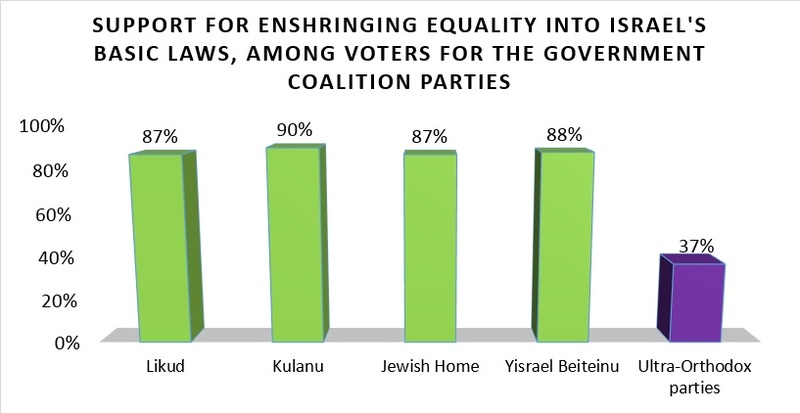 Breaking down the level of support according to Coalition parties voted for in the 2015 elections, shows an overwhelming support of over 87% among voters for the non-Haredi Coalition parties. This includes 87% of Likud voters, 90% of Kulanu voters, 87% of Jewish Home voters, and 88% of Yisrael Beiteinu voters. Even among voters for the ultra-Orthodox parties, 37% support was measured. The survey also asked: “If a party were to declare that legislating the Declaration of Independence as a Basic Law is a central pillar of its election campaign, would that increase or decrease the likelihood that you would vote for such a party?” Among those who expressed an opinion, 36% responded that it would raise the likelihood of their voting for such a party, 15% responded that it would lower the likelihood, and 49% said that it would not impact their votes. The survey reaffirms the statement made by MK Tzippi Livni (head of the Opposition in the Knesset) that the Zionist Union party will launch such an initiative in the coming elections. It indicates that she correctly read the will of the Zionist Union voters. 67% of these voters responded that this would raise the likelihood that they would vote for such a party, compared to 3% who responded that it would lower the likelihood.